KATHMANDU: Local stocks showed lack of direction in the week. 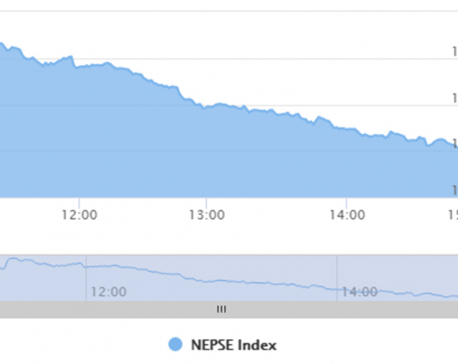 The benchmark Nepal Stock Exchange (Nepse) index began the week's trading with a modest drop of 3.15 points on Sunday. Weakness was also visible on Monday as the index further fell over 7 points. A rally of over 22 points ensued on Tuesday, while Wednesday saw a loss of over 12 points. Nepse closed marginally higher on Thursday. Eventually, Nepse ended essentially flat on week to week basis. The equity index closed a meager 0.20 points or 0.02 percent higher at 1,113.07 points. The bourse consolidated in the review period after declining for four weeks in a row. Despite a surge seen in the mid-week after the mid-term monetary policy review by Nepal Rastra Bank, the overall market failed to find a significant foothold. The overall downtrend witnessed since mid-2016 is still in action as the market is yet to show any clear signs of recovery in the near term. 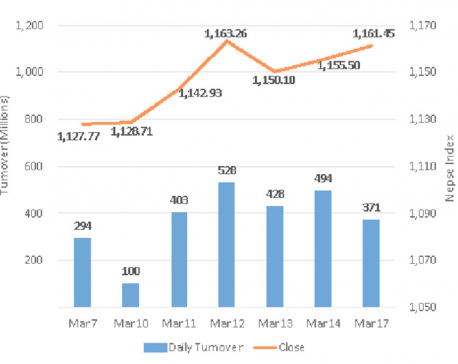 Investors' enthusiasm, meanwhile, seems fairly subdued as the bourse posted a weekly turnover of less than Rs 1 billion. In the meantime, Class 'A' stocks underperformed as the Sensitive index shed 0.32 points or 0.14 percent. Traded sectors turned in mixed performance. Hotels stocks witnessed considerable strength as the group's sub index jumped 1.79 percent. Microfinance and Non-Life Insurance sub-indices followed suit with advances of 0.79 percent and 0.69 percent, respectively. Manufacturing & Processing, Life Insurance and Development Bank sub-indices also closed slightly higher. In contrast, Trading stocks suffered as the group's sub-index tanked 2.45 percent. Hydropower scrips also came under pressure. The segment's sub-index dropped 1.31 percent. Sub-indices of 'Others', Finance and Banking sector also closed in the red. 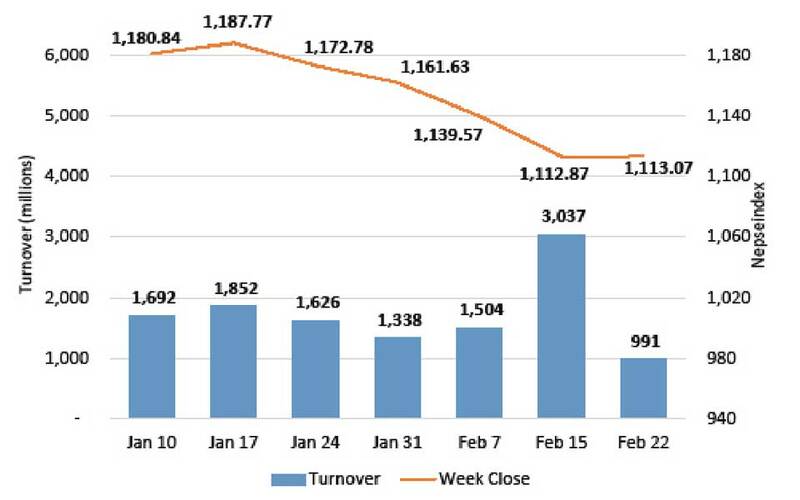 Among actives in the week, Nabil Bank Ltd witnessed the highest transaction of over Rs 55 million followed by Upper Tamakoshi Hydropower Ltd which registered a total turnover of over Rs 51 million. Nabil Bank Ltd Promoter Shares were also actively traded. More than Rs 45 million worth of the scrips changed hands. Besides, Prabhu Bank Ltd, Citizen Investment trust and NMB Bank Ltd were the other top turnover scrips of the week. This week Shivam Cement Ltd floated its Initial Public Offering (IPO) of 4.12 million unit shares to general public. The issue, which was priced at Rs. 300 per share including premium, remained slightly under-subscribed till Thursday, the last day for application. Hence, the offering is extended until full subscription. In other news, Asian Life Insurance Company Ltd will be closing its shareholders' book on March 6 for the purpose of issuing 60 percent right shares to its shareholders. As per the ARKS weekly technical analysis, the market formed a doji candlestick on the daily time-frame as the market lacked conviction in the week. The selling pressure eased slightly as the market snapped its four week losing streak. Further, the index also bounced from the support of 1,100 points level this week which shows some strength in the current scenario. However, with the long term downtrend persisting, cautious investing is suggested until the market shows sign of recovery with substantial volume.